Originally published in SFU News Aboriginal Peoples Supplement on Tuesday January 21, 2014. For instance, the Xwi7xwa (pronounced HwaiWah) First Nations Library at UBC uses the Brian Deer classification scheme, based on the Library of Congress system, but addressing topics from an Aboriginal perspective. “In health, it might focus on diabetes. Hopi would not be collocated with Haida because of the letter H. Tsimshian would be near Haida because of geographical and cultural proximity,” says Walsh. Walsh specializes in helping with Indigenous research methodologies. Modern academic studies are not just about Aboriginal peoples. They are by and for them. “The research is what the community decides they need, not so much what the researcher needs,” says Walsh. The data is considered to be owned by the community not the researchers. “Our digital collections will support Indigenous communities,” says Walsh. To help First Nations students, Walsh is developing more interactive and self-paced learning tools, distance education compatible materials, online modules and videos especially for learners in dispersed or remote communities. She’s currently creating a library orientation program for Indigenous students, as well as a strategy to attract Indigenous high school students. “I want to demystify the academy and help them understand that the library is loaded with resources for them,” says Walsh. She’s also developing specific collections featuring Indigenous knowledge. Examples might be traditional hunting and harvesting methods, aural research recordings of aboriginal languages, and much more. “We also want to ensure the collections are accessible by the indigenous community,” says Walsh. Walsh will work with SFU Indigenous community members developing speaker series, teach-ins, and less formal initiatives that include students, faculty, and staff. She feels the university should have a website that celebrates accomplishments of aboriginal staff, students and faculty. The idea is to encourage other indigenous students to stick with it, and to show off SFU as a place for excellent Indigenous scholarship. “This is me getting back to my dream area,” says Walsh, who grew up in Vancouver with it’s large and diverse Aboriginal community. “Indigenous art is used to promote all sorts of things. It’s frustrating for people to have their culture appropriated, but not represented in the education system,” says Walsh, noting that the SFU library itself is on Coast Salish territory. Her welcoming blanket from SFU’s Office of Aboriginal Peoples has a logo by Haida artist Juanita Ens. An eagle’s tongue touches a mountain, representing the transfer of knowledge. “I think it’s particularly apt in regards to the enhanced relationship with the library I am creating for Indigenous people,” says Walsh. Walsh has been working with Aboriginal communities and SFU students, staff and faculty to determine how best to enhance and develop the library’s services for Aboriginal students. Walsh is also working with SAGE (Supporting Aboriginal Graduate Enhancement), an interdisciplinary and cross-institutional peer-mentoring program that supports Aboriginal graduate students to successfully complete their degree. “Aboriginal graduate students are far more engaged in Indigenous research and methodologies, and issues of Indigenous intellectual property and supporting Indigenous knowledge systems,” says Walsh. With this in mind, she is developing more Indigenous library research and knowledge workshops as well as more culturally relevant library support for distance education courses. In the lead-up to Truth and Reconciliation Week last September, Walsh prepared a classroom resource guide featuring library materials relevant to discussions on the residential school legacy. The guide includes videos, audio-visual materials, and selected print and electronic resources. “We have a very strong collection and I think some people may not have been aware of that,” she says. The library is also assembling a growing collection of live-streamed videos with Aboriginal content. The SFU Library will also be assisting the First Nations Language Centre as it begins to reap research results from its $2.5-million Social Sciences and Humanities Research Council grant to revitalize B.C.’s First Nations languages. The collection will include oral stories and sound files of conversations. 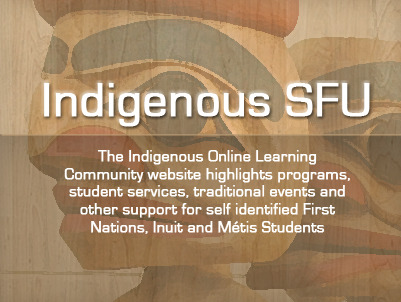 Walsh is also working with the Indigenous Student Centre to build on the existing Indigenous academic content in Summit, SFU’s institutional research repository.